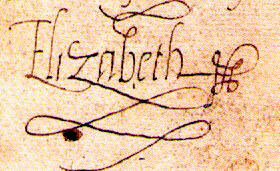 Elizabeth's signature prior to her accession does not contain a "P." I am very familiar with Tudor orthography (handwriting) and have even held in my own hand a document signed by Princess Elizabeth (a letter to Thomas Seymour written in 1547, now in the National Archives at Kew). If one looks very, very carefully at the signature, one can see that as the pen left the "h" at the end of the name, it traced a large loop arching up and back to the left before descending down the middle of what became the sqaure, then formed the loop at the lower left hand corner of the square. It then formed the loops and sqaures in a counter-clockwise motion. The pen then ended its path by descending straight "south" from the upper lefthand loop, touching the lower left hand loop, and ending with a small "j" tail. Thus what may appear to be a "P" is actually a looping path taken by the pen to begin the looped square, and not a "P" for "Princeps." I will email a sample of the signature to Lara, perhaps she can post the photo so that readers can follow along with my description? Elizabeth never signed her name with "the Quene" in English. She instead consistently used "R" to indicate her status as monarch. It is tempting to speculate that the woman who claimed to have the heart and stomach of a King preferred the gender-ambiguous "R" (Regina? Rex?) to the gender-definite "queen." Perhaps the use of the uncertain abbreviation for the Latin term allowed her to feel more authoritative in a world where female authority was limited? Perhaps Elizabeth felt, unlike her sister Mary ("Marye the quene"), that a queen regnant's signature should be distinguished from a queen consort's? I think Mary Queen of Scots also signed "Marie R". Any thoughts out there on whether she did it perhaps in imitation of Elizabeth, or to assert equality with Elizabeth, or perhaps there was some other influence at work? As usual, Foose, you make an intriguing observation. Mary Stuart was a queen regnant almost from birth and did not acquire a consort until well into her reign. She was probably trained to sign "Marie R" from the first day she learned to write. And Elizabeth may indeed have wished to distinguish herself from a queen consort ... and from her half-sister Mary. Mary used "Mary the Quene" from the first day of her reign, months before she was even betrothed to Philip, so her use of that style was certainly not meant to imply any sort of marital arrangement. But if Elizabeth wanted to signal an era of change from the Marian regime to her own, altering the way a female English monarch signed her name ... "the Quene" vs "R[egina]" ... was one powerful symbol for signaling that change. Perhaps I should note that Jane also always signed her name "Jane the Quene," never "Jane R," so Elizabeth was signaling a change from both previous queens regnant. "Mary the Quene"...perhaps as a, reminder, both personally and publicly, that her mother was a queen, also? K of A was told to not call herself by that title, nor was she recognized as such in the later stages of her marriage to Henry. Could this have been a way of Mary honoring her parent? Tracey, I was wondering if perhaps there was some sentimental component to Mary Tudor's signature. Looking at other queens' signatures (some available on this site), we have simply "Elyzabeth" (Elizabeth Woodville), "Elyzabeth the Quene" (Elizabeth of York), and Margaret of Anjou's is simply illegible, it might be simply "Marguerite." I couldn't find signatures of queens of England beyond that. Perhaps there's a monograph somewhere on this topic. Per Phd historian's comment about Mary Stuart learning to write Marie R as early as possible ... could it be that Elizabeth imitated her? Since Mary Stuart was technically a reigning queen before Elizabeth acceded? Looking around on the Internet, I see there is a book of hours that belonged to Mary Stuart's mother, Mary of Guise, and has what is said to be her signature on it -- and it's "Marie R," like her daughter. (The signature is VERY similar to Mary Stuart's, I wonder if there could be a mistake in attribution?) She was a queen consort, not a queen regnant, but technically Marie Regina can mean either. So maybe the style originally came from France? It would be interesting to see how previous queen regnants in Europe signed their names. I see also the Margaret Beaufort signed her name "Margaret R" after her son's accession in 1485. Perhaps this played somehow into Elizabeth's choice of signature ... ? I realize this discussion pertains more to orthography, but a monarch’s choice of symbol can also be analyzed in terms of graphology (the study of handwriting). I took a very amateur stab at some of the personality traits revealed in Elizabeth and other Tudor monarch’s signature a while back. Let me know what you think. I think it is especially interesting to compare Mary Stuart’s signature to Elizabeth’s signature – two very different personalities! Mary of Guise visited Edward VI's court when her ship was driven into Portsmouth. I wonder if Elizabeth was present? This would have been her first (and possibly only) exposure to a non-English queen (yes, Anne of Cleves was non-English but I mean a queen who was not queen of England) and the mother of a future queen regnant. Could she have seen Mary of Guise's signature, Marie R (apparently for Royne, not Regina) and perhaps adopted the style for her own later signature? I think Margaret Beaufort's signature (Margaret R) was for Margaret Richmond, not Regina. She was never a queen. And I guess it wouldn't be incorrect for Catherine of Aragon and her daughter to sign themselves "Yo La Reyna" (I the Queen) if they were writng in Spanish. Thinking about this still more, it might well be that Elizabeth deliberately adopted "Elizabeth R" as a conscious echo of her father, who signed "Henry R." She did make studied efforts to imitate his style and manner, both to advertise his paternity and to promote her own political legitimacy. Her sister Mary would have felt much less of a need to emulate her father, although she could also summon up a fair "King Harry" impression when necessary. Also, in Scotland, Margaret Tudor (Henry VIII's sister) signed herself as 'Margaret R'. It appears that in Scotland that was the tradition for queens as Mary of Guise and Mary Queen of Scots signed likewise. Anyone know about the Scottish queens before Margaret Tudor? Did they sign with a 'R' too? I came across Jones & Underwood's The King's Mother today in a bookshop and it said that Margaret Beaufort signed her name M Richmond until 1499, when she started signing Margaret R. The authors stated that it is not known whether the R stood for "Richmond" or "Regina," but that she could have begun doing this as Henry VII began assigning her governmental authority in some areas, so there is the possibly that her new signature shows a deliberate attempt to give Margaret regal power to some degree but without spelling it out explicitly and maybe giving a certain amount of "deniability" through the ambiguous letter R.
I've been hunting for information on how pre-Margaret Tudor Scottish queens signed themselves, and come up with nothing. The books I have on Margaret Tudor seem to indicate that Margaret only began signing herself "Margaret R" after her husband's death, but there is no definite statement I can point to. They don't include the full letters she sent prior to his death, except for one to her father signed, simply, "Margaret." I'm curious what the symbol represents. I noticed that Henry VIII used a very similar symbol in his signature.